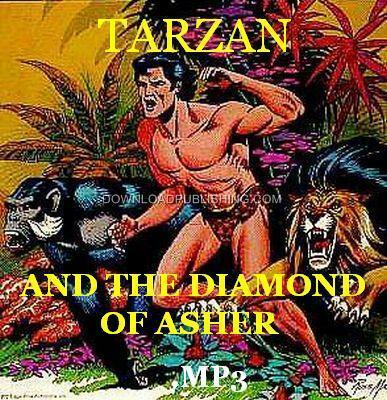 "We bring you Tarzan, that immortal fictional character of Edgar Rice Burroughs, in a new and exciting serial entitled TARZAN AND THE DIAMOND OF ASHER, which is adapted from the novel, 'Tarzan And The Forbidden City.' Deep in the heart of Africa rises a mighty cone-shaped mountain, an extinct volcano, in the huge crater of which lies The Forbidden City of Asher... To reach this stronghold two safaris endure hardships and perils that bring death to some and high adventure to all... One safari is bent on the rescue of the son of its leader... the other, headed by a wily and unscrupulous Oriental, seeks only the Father of Diamonds... And through the intrigue and mystery and the danger moves the majestic figure of Tarzan, Lord of the Jungle." Note: Some of these episodes seem to end rather abruptly. Don't worry, you aren't missing any action, this is where the local radio announcer would state somthing like "Tune in next week for another exciting episode of Tarzan and the Diamond of Asher". Each Episode is about 13 Min. long. A 15 Min. show after the radio station added their commercials.